Though it didn’t score iOS 5’s flashiest updates, the stock Calendar app certainly gets a few noteworthy upgrades of its own in the latest edition of Apple’s mobile OS. 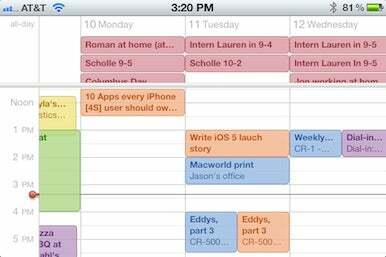 Many of the improvements introduced by Apple seem focused on improving the calendaring app’s interface. Perhaps no new Calendar feature will be more welcome than the overdue ability to swipe between days. 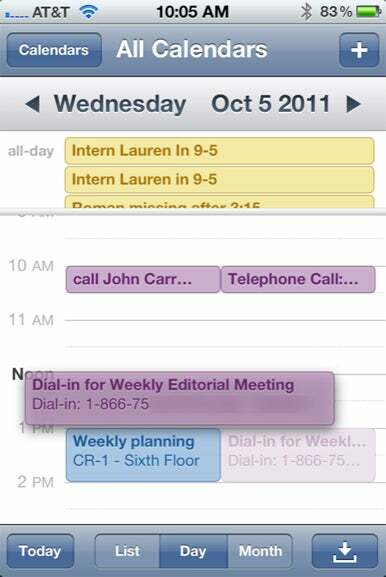 To move from day to day in the old version of Calendar, iOS device users had to rely on the tiny left and right navigation arrows. With iOS 5, simply swiping across the screen in either direction takes you to a brand-new day. Turn your phone sideways, and Calendar will switch to the new landscape-only horizontal view. Speaking of creating events, iOS 5 ushers in a host of improvements to that process. You can tap and hold on your calendar to create a new event set for the time that you tapped. If you’re in Month view, tap and hold on a specific day to do the same thing. Also new is the ability to tap and drag events to move them to new times. And when you tap on events, you can use the tiny dots that appear to adjust their start and end times, too. You can now drag events around to move them to new times. When you’re typing in the details of a new event, the updated Calendar app makes things easier than before. The Title field is pre-selected, meaning that the virtual keyboard is already present, instead of waiting for you to make your first tap. The Notes field used to make you navigate to a separate screen; in iOS 5, it’s now fully embedded in the main event-creation screen instead. Other Calendar improvements support Apple’s stated goal of detethering your iOS device from your Mac. You can now add, edit, and delete calendars straight from your iPad or iPhone—no computer required. Another new option allows you to change the pastel colors of your calendar(s); you can’t pick colors willy-nilly, but you may choose among seven lovely hues. Calendar mostly feels the same as it did in previous incarnations—but as if it’s just received an affectionate tune-up. The app is easier to use, particularly for adding new tasks, and it gains just enough to make using it simpler and more efficient.